Back in February of this year, Oculus unveiled the first crop of "Oculus Ready" PCs from Asus, Dell, and Dell's Alienware division. Pricing started at $949 for a pre-built system bundled with a Rift headset and went up from there. 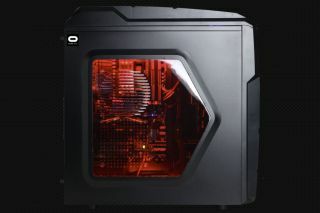 Now eight months later, Oculus has teamed up with AMD and CyberPowerPC to cut the cost of entry on the desktop side nearly in half to just $499. Behind the price drop is a new technology Oculus calls asynchronous spacewarp (ASW), a variation on asynchronous timewarp (ATW). What it does is compare previously rendered frames to detect motion between them, and then uses that information to extrapolate the position of scene components in the next frame. This allows the Rift to render a consistent 45fps while injecting re-projected frames to display scenes at 90fps. That means less strain on your hardware. Previously the minimum requirements called for an Nvidia GeForce GTX 970 / AMD 290 equivalent or greater paired with an Intel Core i5-4590 processor or higher. RAM and output requirements are unchanged, while the new specs call for one less USB 3.0 port and the OS has been bumped up from Windows 7 SP1. This is where AMD and CyberPowerPC come into play. They've collaborated with Oculus to be the first out of the gate with a $499 PC (when purchased with a Rift) that meets the new system requirements. The limited edition system pairs an AMD FX-4350 processor with a Radeon RX 470 graphics card. Other confirmed specs include a 1TB hard drive, DVD drive, mouse and keyboard peripherals, and Windows 10. Lowering the cost of entry should help bring VR gaming to more people, though it's still not cheap as a whole. The cost of PC with headset is just shy of $1,100, and you can add another $199 if you plan on purchasing a set of Touch controllers this December. While not cheap, it's a step in the right direction. The bigger step will come if and when Oculus is able to lower the cost of its headset. Bring that sucker down to $299 or somewhere thereabouts and the orders might come pouring in.